If you follow At Home with Vicki Bensinger by now you know I love to cook. However, I’ve never considered myself to be much of a bread baker, although, I love bread. About a year ago I had lunch with some friends at a mall nearby, and afterwards stopped into Anthropologie to look around. If you’ve never been in that store they carry primarily women’s clothes, but also have a hodge podge of other fun items for your home, such as, unusual dishes, soaps, fragrances, candles, kitchen tools, and cookbooks. The cookbooks they carry are always unique, inspirational and typically end up on the best sellers list. One cookbook in particular caught my eye that day because of its cover photo. I rummaged through the book and debated whether to purchase it or not – I have oodles already! I left the store without it, but kept thinking how much I wanted to make what was on the cover of that cookbook. I went into Barnes & Noble and saw it, and got on Amazon considering whether to purchase it or not. Then finally I couldn’t help myself and just had to tackle the Fresh Blueberry Brioche that was so beautifully presented on the cover of HUCKLEBERRY – Stories, Secrets, and Recipes From Our Kitchen, by Zoe Nathan, baker and restaurant owner with her husband Josh Loeb and Lauren Almerinda. The photos which are stunning are photographed by Matt Armendariz. This just goes to show, if you have stunning photography in a cookbook, it definitely helps sell the book – I’m living proof. The Fresh Blueberry Brioche takes 2 days to prepare, although you could feasibly do this in a day if you start early in the morning. Since I’m not an expert at bread baking I was careful to read the instructions many times over, and then again. I made sure I had all my ingredients out, and measured ahead of time (mise en place) to insure that the mixing and blending would go smooth, and it did! This is key!!!! 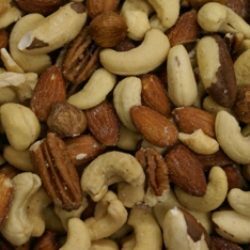 Allow plenty of time when making this recipe. It really isn’t difficult, but there are quite a few steps that are critical in the outcome of the brioche. While reading the recipe below, be sure to check the notes I’ve made in italics. 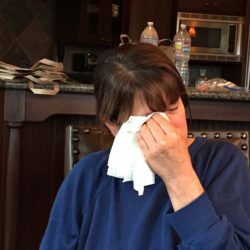 They were areas that I questioned whether I had done something wrong, only to see everything turn out perfectly. 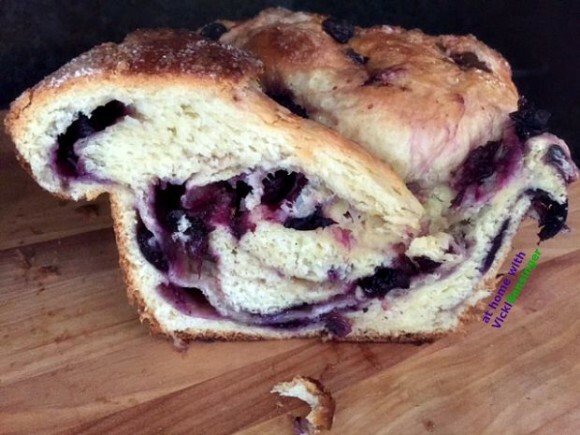 I will make this Fresh Blueberry Brioche again and again, and as I perfect it I’m sure I will tweek it my own way. I can’t wait to gift these loaves to family and friends for the upcoming holidays – it’s that good! I was so jazzed at how beautiful this turned out, but my husband couldn’t quite understand – since he’s not a foodie. When I asked him if he could recall how he felt after putting together his remote control airplane, and he said “yes,” I said, “that’s how I feel about this bread”. He totally understood then. It’s all about creating and the outcome. We enjoyed the Fresh Blueberry Brioche, and then shared it with our neighbors to spread the love and carbs around! I know you’ll enjoy this. If you find you have urgent questions when preparing it, don’t hesitate to contact me – I’m always happy to help. Now to tackle the other stunning recipes in HUCKLEBERRY – I can’t wait! This bread is spectacular inside & out! A must for everyone to make! Day One: Place the fresh blueberries on a plate and freeze in a single layer. Do not use frozen blueberries, as they are too watery. Increase the mixer speed to medium-low and work the dough for 6 minutes. Pause every minute to push the dough back down into the bowl and off the hook until it pulls off the sides and looks like a strong bread dough. Dump the dough onto a lightly floured work surface and press into a 16-by-10-in/40-by-25-cm rectangle. It does not need to be exact. Position the dough vertically, with a short side nearest you; distribute the blueberries and 2 tbsp. of the sugar along the top edge and gently roll down, toward you, into a log. Place the log on a greased sheet pan (can spray with non-stick spray), wrap in plastic, and refrigerate for at least 1 hour, or preferably overnight. Day Two: Grease a 9-by-5-in/23-by-12-cm loaf pan (I used non-stick spray). Reshape the dough one last time by pressing it into an approximate 12-by-6-in/30.5-by-15-cm rectangle and cover with the remaining 2 tbsp. of sugar. (I pressed gently to try not to burst all the blueberries). With the dough positioned vertically, roll down toward you, tightly this time. Place into the greased loaf pan, loosely wrap in plastic, and allow to rise in a warm place until more than doubled in size, about 3 hours. (The berries oozed their juices in the bottom of the loaf pan - it's fine). As the brioche nears readiness, preheat your oven to 350°F/180°C. Carefully brush the dough with the egg wash (see ingredients list above), making sure the egg doesn’t pool around the edges. Liberally sprinkle with sugar. Bake until golden, 40 to 45 minutes. Allow to cool for about 15 minutes in the pan. Then transfer to a cooling rack. This keeps, wrapped well, at room temperature, for up to 3 days, but who are we kidding, it will be lucky to survive 3 minutes out of the oven. 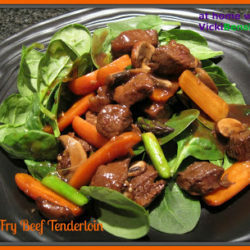 Bravo to you Vicki, this sounds insanely good! I know the aroma probably drove you crazy. It tastes incredible and buttery soft. I had so much fun creating this that when it was all finished I couldn’t believe it could look any prettier. I was quite proud of myself as anyone would be if they make this. I’ll be making this again for holiday gifts and for our table, it was that good! I hope you’ll try it. One can never have too many cookbooks! Although I admit I really, really try to limit the number of new ones I buy. And usually fail, miserably. 😉 Anyway, I don’t believe I’ve ever had blueberry brioche. Sounds like a terrific idea! Love the idea of this — thanks. I know it’s crazy how carried away one can get with cookbooks. My husband finally had someone come out to build me a large closet for mine so i could keep them in one place rather than everywhere. It’s nice! 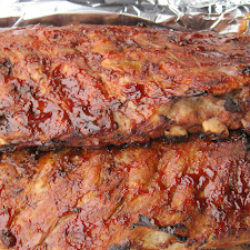 I hope you or Mrs. KR try this recipe, it’s wonderful! Some things are worth taking 2 days to prepare and from looks of it, it looks like this brioche is one of those things. Downright beautiful! You look like a baker to me Vicki! Thanks MJ. This turned out prettier than I could have imagined and the taste is perfect – soft and buttery and not too sweet. It’s just right as Goldilocks would say. 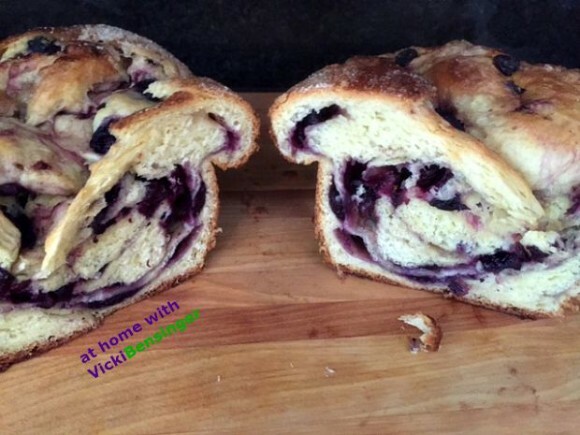 What a creative and beautiful brioche recipe, Vicki! I hope you’ll try it Angie, it’s so tasty and beautiful! I feel like an artist! I love fresh Brioche and the combination with blueberries sounds truly irresistible. The Fresh Blueberry Brioche was so delicious! It had just the right amount of berries, it wasn’t too sweet, or too buttery, but just right! I hope you’ll try it. Besides all that it truly was a work of art. I was so proud of how it turned out. I can’t wait to make this again, and again, and again! I recently got Huckleberry from our public library and there are some amazing recipes in it! I love the name too 🙂 Oh my, this brioche sounds wonderful! Oh Susan, if you still have the book you’ll have to try it. However, even it you took it back to the library you have my recipe to follow with tips. What a stunning loaf, Vicki! Brioche is one of my favorite breads and this berry twist makes it even more enticing. Well done!!! Thanks Liz. I’m pretty sure I’ve seen you make something similar. You’re probably a pro at bread baking by now. I have to say I was quite pleased at how it turned out plus it tasted as good as it looked, which is always a plus! Your brioche looks wonderful. I’ve read about that cookbook elsewhere, and now I really have to check it out. Love the analogy you used with your husband – sometimes we just need a way to explain things to be understood! Hi Beth, If you haven’t seen Huckleberry yet I highly recommend checking it out. It’s a beautiful book with lovely photos and well written and tasty recipes. As for the analogy between building a remote control plane and creating a stunning loaf of bread, I couldn’t figure out how else to get the point across. I was so proud of how this loaf turned out and since he’s not a foodie, he just didn’t get it. After that, he got it! I’m glad he did. 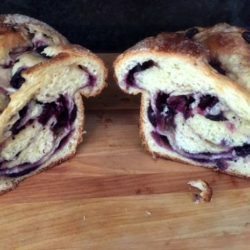 I hope you’ll try making this Fresh Blueberry Brioche. That is a stunning piece of bread. It’s amazing. The berries are definitely a great touch.